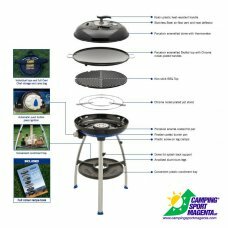 BARBECUE A GAS A BASSA PRESSIONE E FORNELLI 3 IN 1 PORTATILE. - COPERCHIO E TERMOMETRO INTEGRATI. - COMODE SACCHE PER TRASPORTO/CONSERVAZIONE. - PIETRA OLLARE E TEGAME PER ARROSTO. POWER BANK PRATICO E TASCABILE PER RICARICARE IN POCO TEMPO IL TUO SMARTPHONEMUNITO DI CAVETTO PER C..